Mix together all the dry ingredients. Gently stir in the chocolate chips. In a separate bowl, combine egg, milk and butter. Stir into the dry mixture. Do not beat! Bake at 375° for 20 minutes. 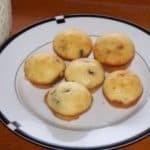 Yield – 9 extra large muffins or 4 dozen mini muffins….and who know’s how many regular muffins…somewhere in between 9 and 24…hehe. Just be warned…if you make the miniature versions, I you can easily eat a dozen before you blink your eyes!